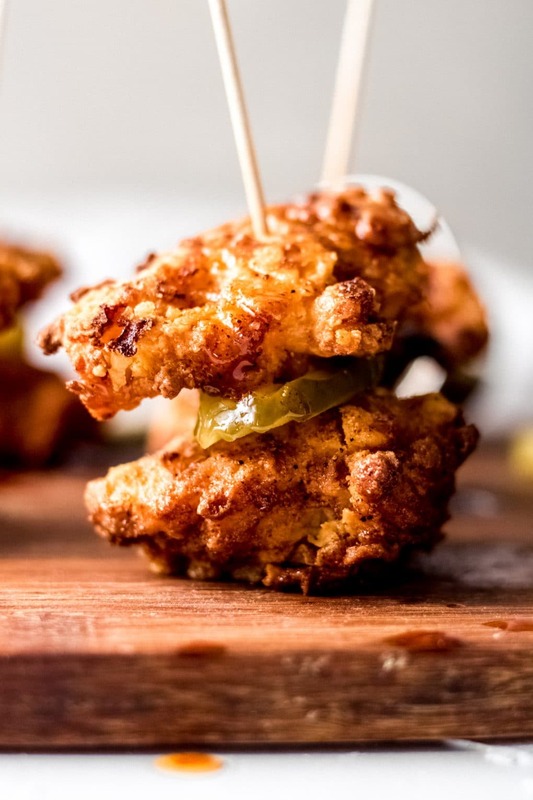 These gluten-free airy fryer Nashville chicken bites are full on flavor while being super easy to make. 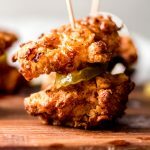 Don’t think that eating gluten-free means you have to sacrifice delicious taste; I’ll show you how with these Nashville chicken bites! 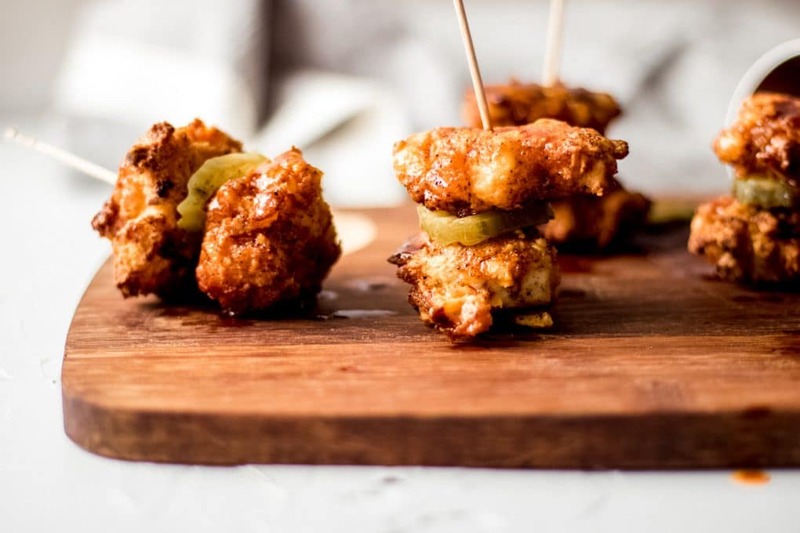 Delicious Gluten-free Air Fryer Nashville Hot Chicken Bites! This recipe came to me in the shower, sounds crazy right? I was thinking about my Nashville Hot Chicken Sandwich recipe and cooking with my air fryer when I thought to myself – I need to create a Nashville Hot Chicken air fryer recipe! I’ve been loving my air fryer recently, so I’ve been brainstorming recipes I could make using this handy countertop appliance. And, if you read my recent experience with the EverlyWell Food Sensitivity test, you’ll know that gluten is something I’m trying to avoid. But, my goal is to show you that eating gluten-free doesn’t mean you have to sacrifice delicious flavor! Cooking with an air fryer for the first time might be intimidating. I’ve gathered up some of the most common questions I receive about cooking with an air fryer. Does it take longer to cook in an air fryer? The quick answer is no. However, if you’re cooking large quantities, it may take longer depending on the capacity of your air fryer. Does the food get crispy in an air fryer? Yes! Your food will get crispy when cooking in an air fryer. To help with this, I always coat any breaded food with sauce or brush oil over the top during the last 5 minutes of baking to help give it that final crisp. Is the air fryer hard to clean up afterwards? No, not at all! Most have a removable basket that you can easily take out to wash and clean up. It’s actually LESS mess because there’s no oil splatter from pan frying. Is Nashville hot chicken spicy? Yes, there is a kick to Nashville hot chicken. However, it’s not over the top hot and spicy. Bread your food as you normally would for frying. Flip about halfway through the cooking time. Brush with your sauce or cooking oil for the last 5 minutes of cook time. Cook at a slightly higher temperature than you would if oven baking. The following are affiliate links. We are a participant in the Amazon Services LLC Associate Program, an affiliate advertising program designed to provide a means for us to earn fees by linking to Amazon.com and affiliated sites. Please see my affiliate disclaimer. Perfect side dishes for Nashville Hot Chicken! Enjoy these other chicken recipes! Having to go gluten-free doesn’t mean you have to sacrifice flavor. 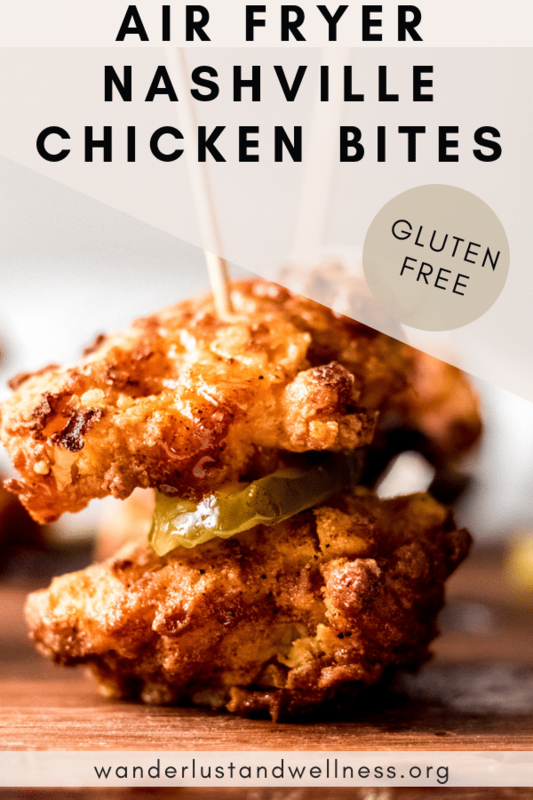 These gluten-free air fryer Nashville chicken bites are delicious and easy to make using your air fryer. You’ll never know they’re gluten-free! Cut the chicken breasts into small 1-inch pieces. In a small bowl, whisk together the coconut milk, eggs, and 1 tbsp. Louisiana Hot Sauce. In another bowl, add the gluten-free flour. Dip the chicken pieces, one at a time, into the flour mixture, then into the milk mixture, then back into the flour mixture. Place into the air fryer basket. Continue until the air fryer basket is full. You want a single layer of chicken pieces that are not touching. Cook in the air fryer at 400 degrees F. for 20 minutes. At the ten minute mark, open the air fryer basket and flip the chicken pieces. While the chicken is cooking, combine the ingredients for the Nashville hot chicken sauce in a small bowl and stir to combine. Once the chicken has cooked for 20 minutes, open the air fryer basket and brush both sides with the Nashville hot chicken sauce. Cooke for an additional 5 minutes, then remove and set aside to cool. Continue this process until all chicken has been cooked. Serve with sliced dill pickles.